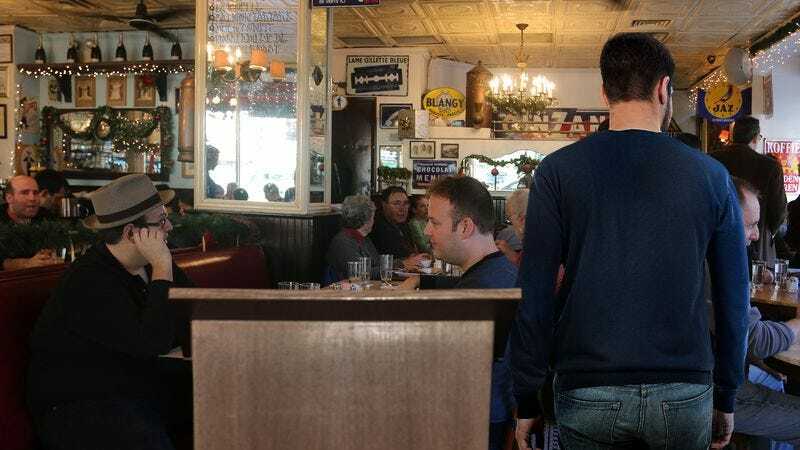 SCITUATE, RI—Finding no one waiting to greet him upon entering the restaurant Monday afternoon, local man Adam Peretti reportedly planned to continue slowly drifting toward the middle of Sidney’s Bistro until a host redirected him to a seat. “Someone’s going to see me eventually and point me in the right direction,” the 31-year-old reportedly thought to himself as he took several tentative steps into the dining area, scanning his surroundings for an employee who might come to his aid before shuffling several feet farther toward the center of the establishment. “If I spend enough time just wandering between the booths with a puzzled look on my face, someone’s bound to come over to me, right? Man, I really hope somebody notices me soon—I’ve already passed two tables.” Sources confirmed that Peretti reached the exact midpoint of the restaurant moments later, at which point, having yet to be approached by an employee, he reportedly opted to slowly turn around in a circle with his brow furrowed.